Warning: Not your normal light, entertaining post. I felt the heaviness in the air immediately. 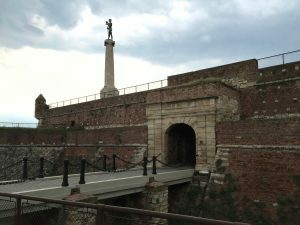 The mood of the country seemed dark, just like the rain-filled clouds that greeted me when I arrived to Serbia. 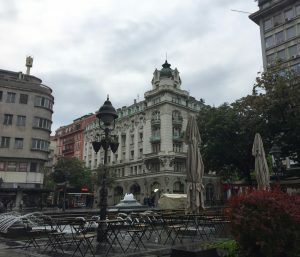 Spring had definitely not sprung and the weather in Belgrade was unseasonably cold and wet. Driving from the airport to my friend Renee’s childhood home, we skirted the city and headed into the suburbs, passing blocks of multi-storied, concrete buildings—the architectural symbol of the communist-era. Oh yes, I thought, I remember this. From Russia to (East) Germany to Prague to Mongolia, this fabled simple box architecture symbolizes another time and place. 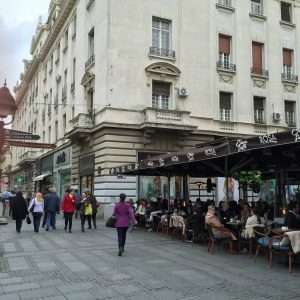 It possesses no beauty, but does remind locals of a happier era—when Belgrade was at the top of its game. When it was the capitol of Yugoslavia, and the center of its political and cultural life. 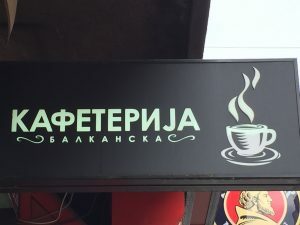 “Amerikanka” –that’s what I was called in Serbia. The first time I heard it, I laughed, but quickly grew fond of the word. Walking the crowded downtown streets, Renee suggested we speak softly (in English). I was surprised by her comment, but she said many people hadn’t forgiven America for bombing their city. That yes, it was technically a NATO bombing, but everyone thinks NATO is America. Renee added that people were crushed because America was always a land they admired and loved, and now they felt deceived, betrayed. “But what about the genocide, the ethnic cleaning, that Serbia inflicted?” I said. The Cryllic alphabet is alive and well. By the time I landed in Serbia, the war had been over for 15 years; however a bombed out building near the train station, the Ministry of Defense, was deliberately left in ruin as a reminder of the injustice done to the people of Serbia. I stood in front of the ruble as men and machinery came in for the very first time to begin the cleanup. Belgrade and its leaders had been simmering the stew. 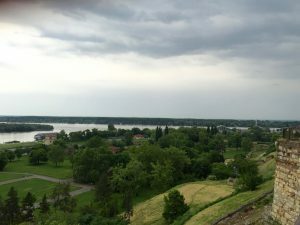 Another ingredient in the recipe — 30,000 Syrian refugees descended upon Belgrade last year. Some joked that the country wasn’t worried, though. They knew that the refugees would move on—Serbia offered no opportunity, no hope. The masses did depart for the north, but the memory of their arrival lingers. 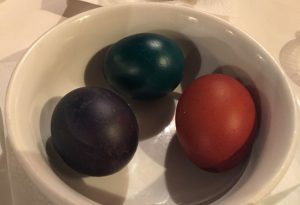 Orthodox Easter Eggs–We arrived just in time. Where the Saba meets the Danube. Now, do you see where I’m going with this? Please forgive the digression and be patient. A pedestrian street with outdoor cafes. Travel teaches us so much. Observing other people’s mistakes should also teach us; but it rarely does. 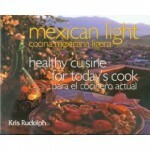 Normally, I would write about the entertaining facts of travel and the wonderful food I discover along the way. 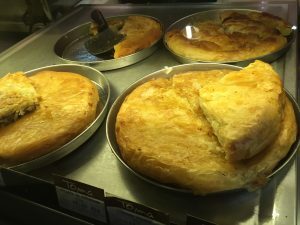 In Serbia, it was burek–phyllo dough stuffed with fresh cheese and sometimes vegetables or spiced ground beef. I would also tell you how the smell of tobacco was overpowering in all the restaurants and that, until then, I had (thankfully) forgotten what it was like to have a meal in a cloud of smoke, but what I saw and felt on this particular trip was so much bigger and more important than all of this. Nationalism is roaring its evil head again in Serbia. People are angry, just like in much of Europe and even here at home. History teaches us, though, that nothing good ever comes of nationalism. By the time I was 10, I had read “The Rise and Fall of the Third Reich.” By the age of 12, I was studying German. In college, I studied WWII history, continuing my education in Germany. I took classes with former Nazi officers and Hitler Youth, because I wanted them to tell me—Why does Grandma Kramer have a tattoo? And even though I read all the books and knew the timeline of events, as well as spent a few holiday weekends visiting concentration camps instead of having fun with friends, I still didn’t understand how humanity could allow something like that to happen. I wanted answers—answers from the people who had lived it, the ones who had stood in agreement, as well as silence. Does silence mean agreement? Where is the line? And does that line change when the stakes are higher? When your country is on a very dangerous path? Of course it does. I didn’t think I’d see this dynamic in my lifetime, but I guess I give humanity too much credit. We’re not the brightest of creatures. We don’t learn from history, or the mistakes of others. The tide is turning in Serbia. I saw and listened to frightening stories in Hungary and Austria, recently, as well. And then I came home and saw it happening in America. What I had read in all those books, is now unfolding before my very eyes and instead of a sea of indignation, I see support and way too much silence. I sit in dismay watching a completely unqualified man convince people that he’s a leader. I see how he takes people’s frustrations and despair and puts them into his large cauldron. He then stirs in the other essential ingredients: fear mongering, hatred, nationalism, scapegoating, ego, and misinformation spouted with extreme conviction. He preys on ignorance and the uneducated. If someone disagrees with his views, he stops everything to say, “Get him out of here!” —a textbook tactic of authoritarian leadership. Some people cheer his action, others laugh at it. But what I want to know is, where’s the outrage? I see top politicians backing madness, some claiming that they can control the man. Their ignorance is shocking and it shows that they are as unqualified as he is. I don’t believe this man will become President. He’ll probably walk away in order to keep his inflated ego intact and his tax returns a secret. Supposedly, 40% of Americans stand behind this man and that’s what we, as a country, need to fear. We should fear ignorance and hatred. We should fear voters who are willing to throw their country and its people under the bus in order to amass huge personal wealth. The irony of this election is that the working class, via their segment of voters, is the strongest supporter of our 1%, and they don’t even realize it. My story is about not being silent. My story is about truly understanding why Grandma Kramer had a blue tattoo. 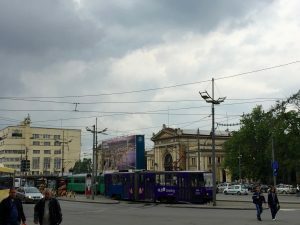 Trams in front of the Belgrade train station. Last summer, a sea of Syrian refugees camped out here.